Over the summer, two teams of Sheridan researchers visited Breakthroughs Film Festivals and the Toronto Fringe Festival to study rising challenges in Toronto’s arts sector. Brandon McFarlane (Professor of Creativity and Creative Thinking), Sheridan researchers, and community partners are now making cultural and professional development opportunities more accessible to the next generation of arts leaders to highlight the talent overlooked in Toronto. Over the next couple of months, collaborators will be facilitating a new, three-year strategy for Breakthroughs Film Festival, thanks to the generosity of the 2018 SRCA Growth Grant. Aisling Flynn-Post (BA, Film & Television), Rose Daniels (BA, Film & Television), and Laura Chute (BA, Photography 2018) will be working alongside Breakthroughs to end gender inequity in Canadian film—a stigma needing to be crushed in the industry. Breakthroughs already supports emerging female filmmakers by hosting an annual festival, offering post-production grants, and professional development training. Their website is worth a read. A second team attended the Toronto Fringe Festival to begin expanding the Theatre Entrepreneurs’ Networking and Training program (TENT) and recommend models for fiscal sustainability. Matthew Wong (BA, Applied Information Science) designed and facilitated an innovation workshop for 20 TENT participants. Thanks to Wong’s expertise, a new cohort of emerging theatre entrepreneurs are better prepared to publicize their talents, undoubtedly delighting audiences everywhere. Theatre entrepreneurs learning how to apply creative problem solving strategies. Photo by Kate Dockeray. 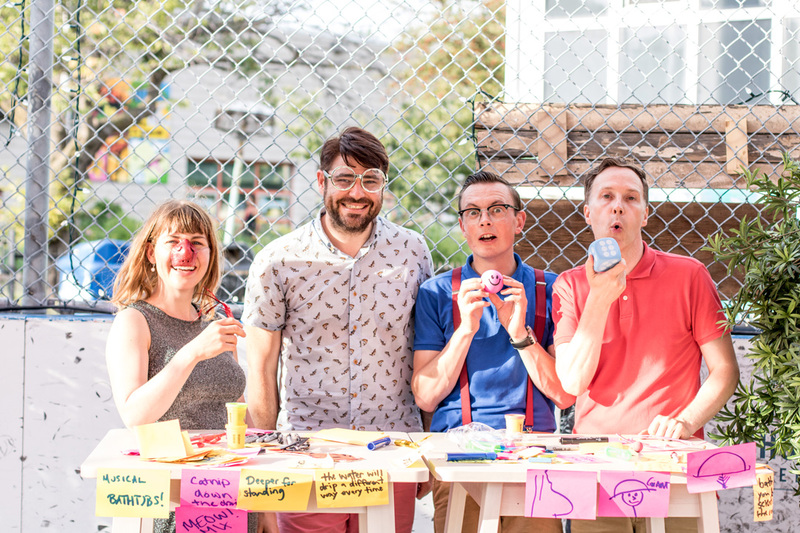 McFarlane encouraged Fringe-goers to ‘Get Creative’ by collaborating with performers Allan Turner and Christopher Hedrick from A Kev ‘n Cal Mystery, and Alexandra Simpson from Upstream Downtown to run a creativity workshop at Postscript—the festival’s hub. McFarlane introduced creative problem-solving strategies which the clowns modeled hilariously. Kate Dockeray (BA, Photography) documented the first successes of the Sheridan-Fringe collaboration. The project integrates Creative Documenters who produce unique works to share the Creative Humanities story with broad audiences. Dockeray snapped fun photographs that you’ll discover in unexpected locations on the HMC campus. We’ll be working with our community partners to remodel Toronto’s creative industries. Expect imaginative innovations and novel outputs. Humanities research is evolving. We invite you follow our story and share students’ amazing achievements with as many people as possible! Take a look at one of our social media accounts and check out Breakthroughs’ and Fringe’s upcoming talent!